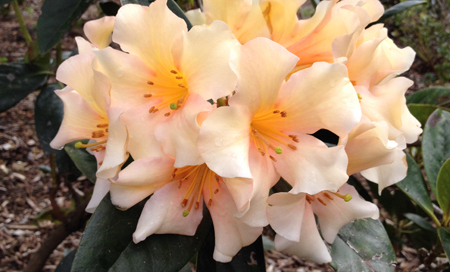 It is with pleasure that we present the 2016 volume of The Rhododendron, bringing you news and stories from around the globe. We welcome back Frédéric Danet as a contributor. Frédéric has collected widely in West Papua, and on one of his trips, rediscovered R. helodes, a vireya species not seen for over 60 years. Frederic observed this species growing in association with em>R. saxifragoides. Close examination showed that R. helodes shares many morphological similarities with R. saxifragoides, and in this article, Frédéric reclassifies it as R. x helodes, a natural hybrid of R. saxifragoides and another species (possibly R. brassii). The Society is most appreciative that Frédéric has published this article in our journal.